It's not just for stoner posters anymore. 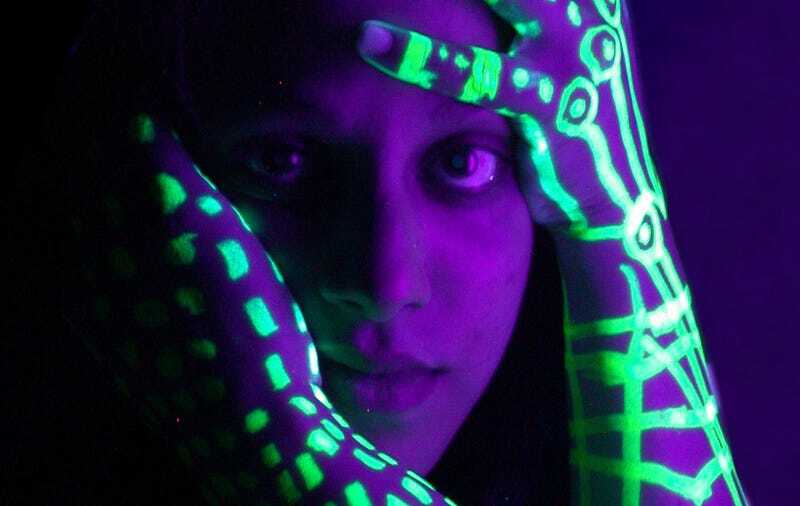 For this week's Shooting Challenge, you're going to elevate the blacklight to fine portraiture. So what is a blacklight? Really, it's just a UV light. Invisible to the naked eye, this wavelength reacts to phosphors—any substance that emits visible light when it reacts to radiation. So the invisible UV radiation strikes the phosphors—say, a marijuana leaf on an Insane Clown Posse poster—and the phosphors glow, trippy-style. A camera captures this phenomenon easily [brief tutorial here]. All you need is a pair of blacklights, a subject painted in reactive pigment, a tripod and probably a black backdrop to make the image pop. (UV lens filters may clean up the image a bit, but they're optional if you don't own one). <— I love that clip, too, which is a great walkthrough from Julius Ise on taking blacklight portraits. He ups the ante a bit, mixing some visible light to help the figures pop, but the premise is no more complicated than anything you can set up in the corner of a garage. Our lead shot is a crop of flickr's Retrofresh!. I dig the maturity of the pose, the strange coloring of the effect. Send your best photo by Monday, June 18th at at 10AM Eastern to contests@gizmodo.com with "Blacklight" in the subject line. Save your files as JPGs, and use a FirstnameLastnameBlacklight.jpg (970px wide) and FirstnameLastnameBlacklightWallpaper.jpg (2560px wide) naming conventions. Include your shooting summary (camera, lens, ISO, etc) in the body of the email along with a story of the shot in a few sentences. And don't skip this story part because it's often the most enjoyable part for us all beyond the shot itself!